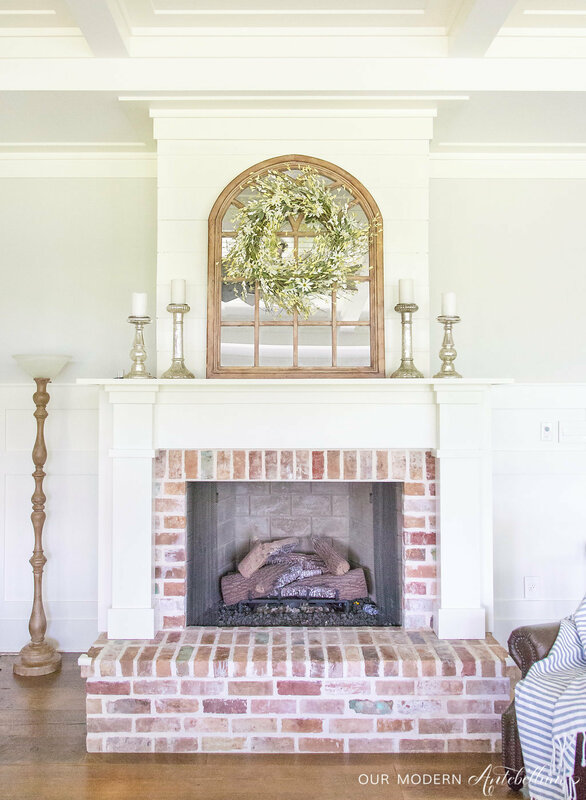 Welcome to another edition of my Bright White Home Series! Today I’m so pleased to share with you a new friend of mine and her beautiful home. I met Ashley of Our Modern Antebellum when I happened on her Instagram feed months ago. 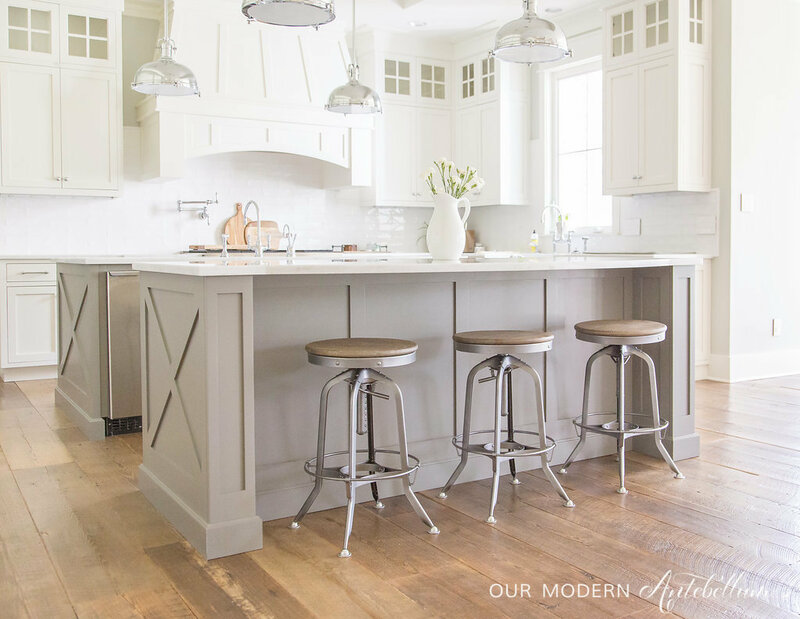 I fell in love with her gorgeous kitchen and double island and had to see more. 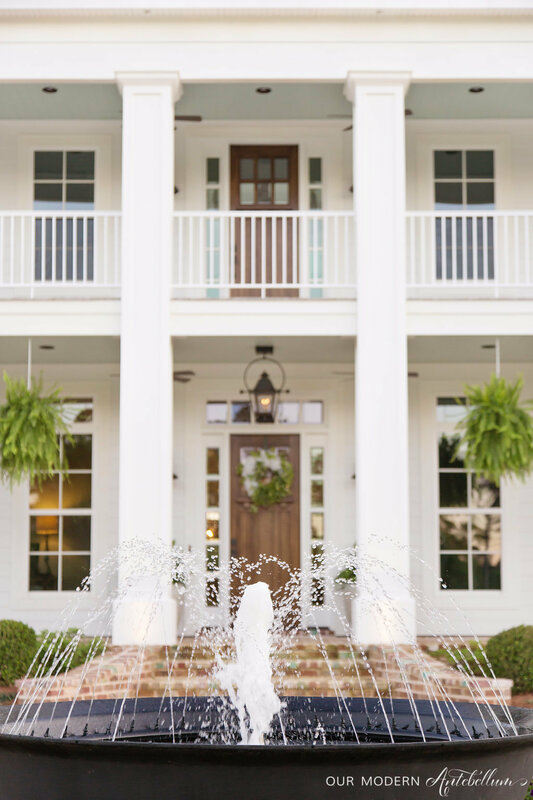 Ashley is a former architect, turned stay-at-home-mom and her talent for design shines in this fabulous Louisiana home of hers. I’m so grateful she allowed us in today so that I could share it with all of you here! 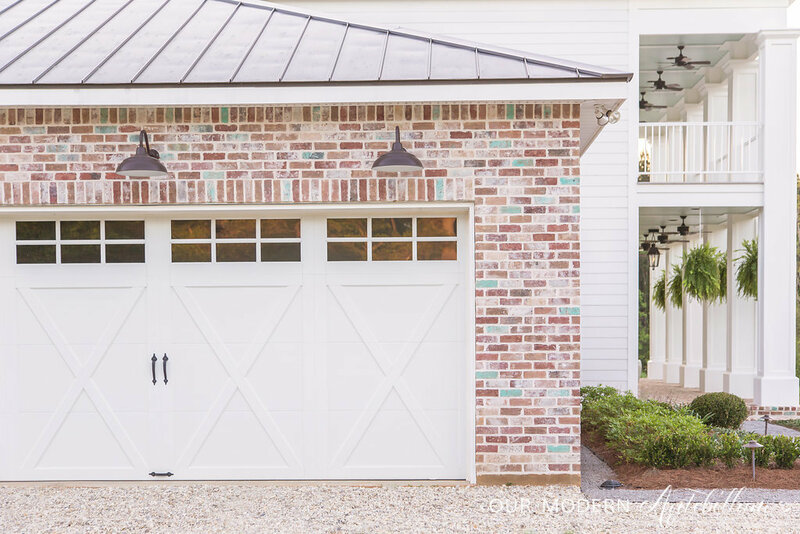 If I turned onto this driveway and saw this gorgeous exterior, I would not be able to do anything but dash inside to see the rest of the home. The fountain is such a perfect touch to this circular driveway. 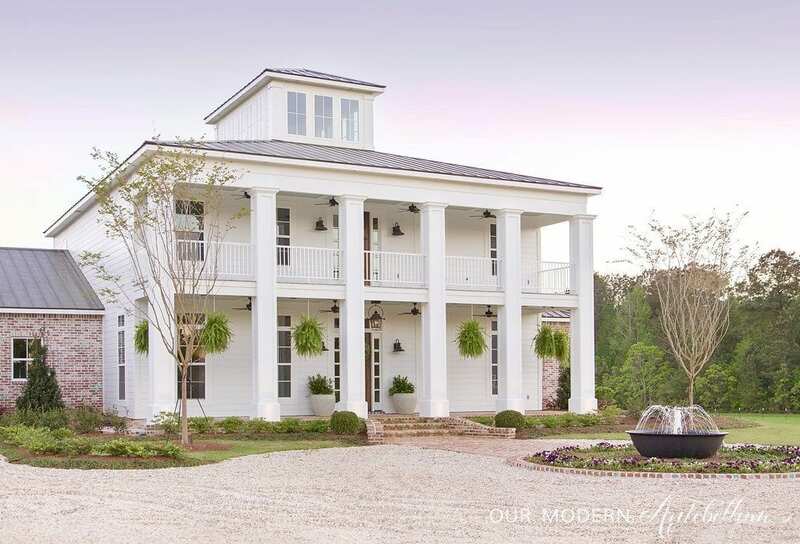 This is a stunner for sure, with old Texas brick and farmhouse style. The exterior paint used is White Dove and trim is Simply White (both by Benjamin Moore). I want to start at the top for a moment. 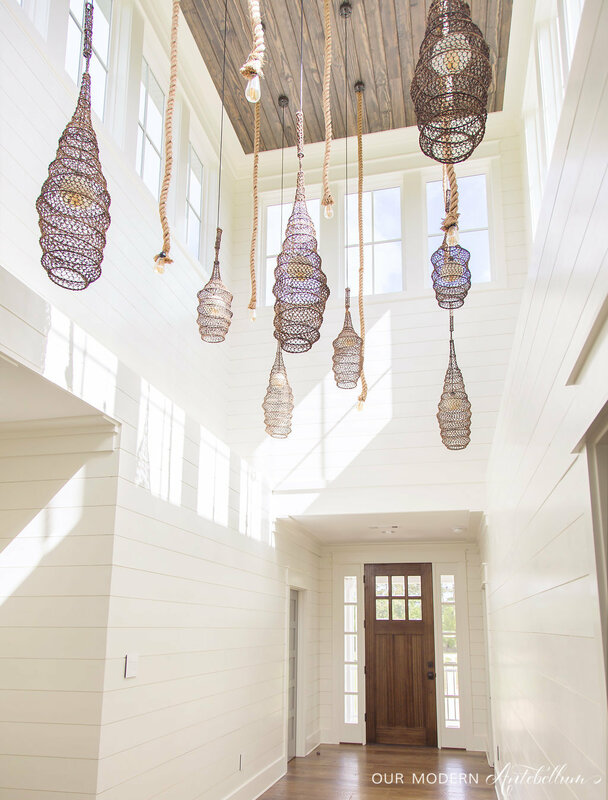 This unique upstairs hallway includes a cupola that captures your attention with such beautiful lighting and design. 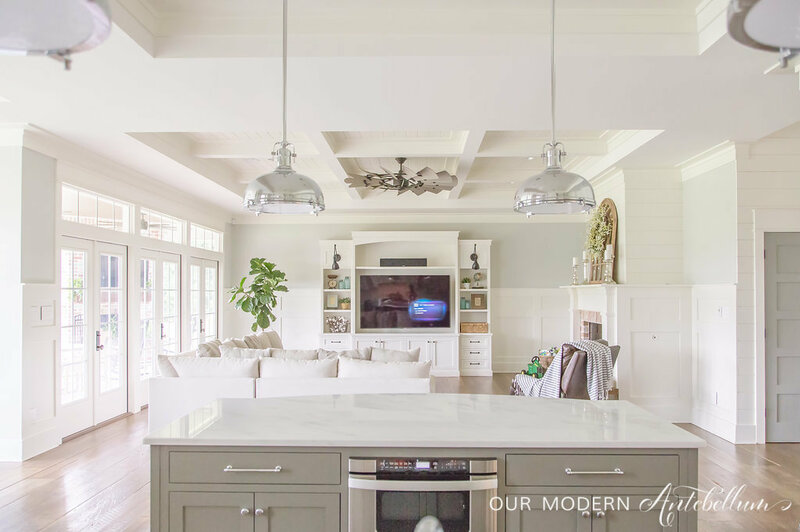 Ashley uses horizontal shiplap, painted in White Dove by Benjamin Moore, to continue inside with her fabulous farmhouse design. How fun is this shot looking up?! 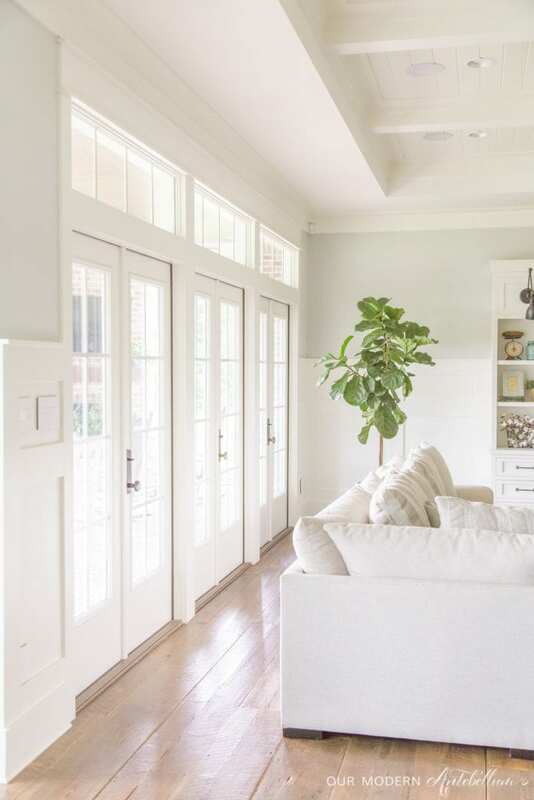 This space might being one of the happiest in the entire home, with all of those windows and light streaming in! I’m a huge fan of the handrail matching the flooring, so I really love these stairs. Ashley breaks up the shiplap by not using it throughout the entire home. She also uses board and batten. 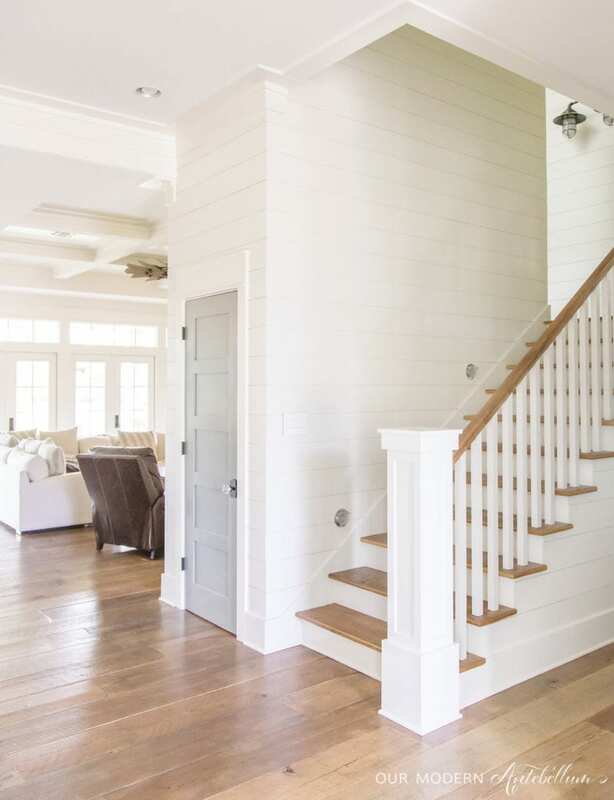 But this center wall along the staircase in shiplap is fantastic! I love this look. Look at this gorgeous dining room! I love that Ashely has added a touch of elegance to her chandelier to complement the rustic feel. Wall color is Gray Owl by Benjamin Moore. All trim is done in BM White Dove. 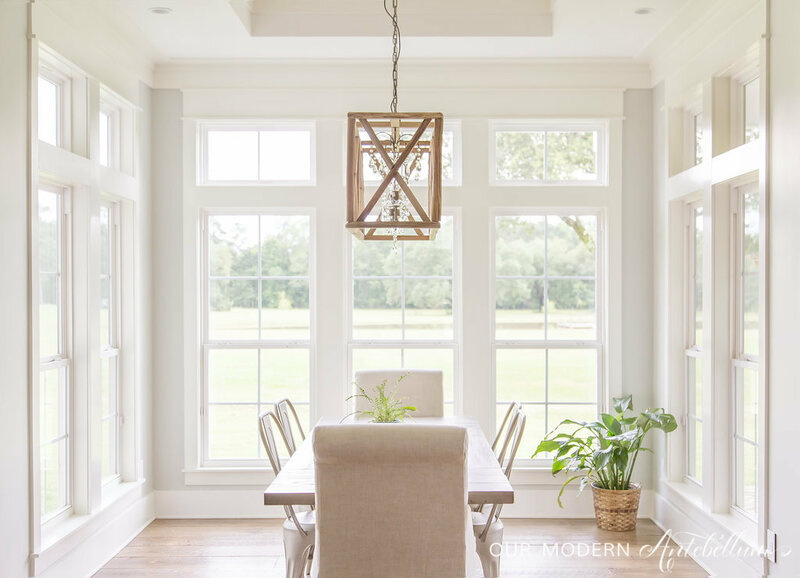 I can’t get over all the gorgeous windows and all the natural lighting in this dining room! 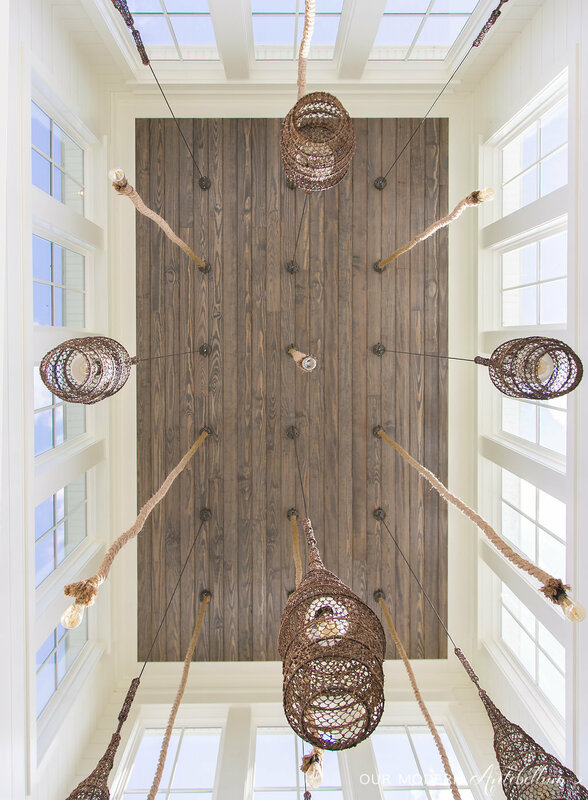 Can you believe the wood flooring is antique pine from an old cotton gin in Alabama? I love that there’s a story behind this space. I love mixing a little “old” with a little “new”. 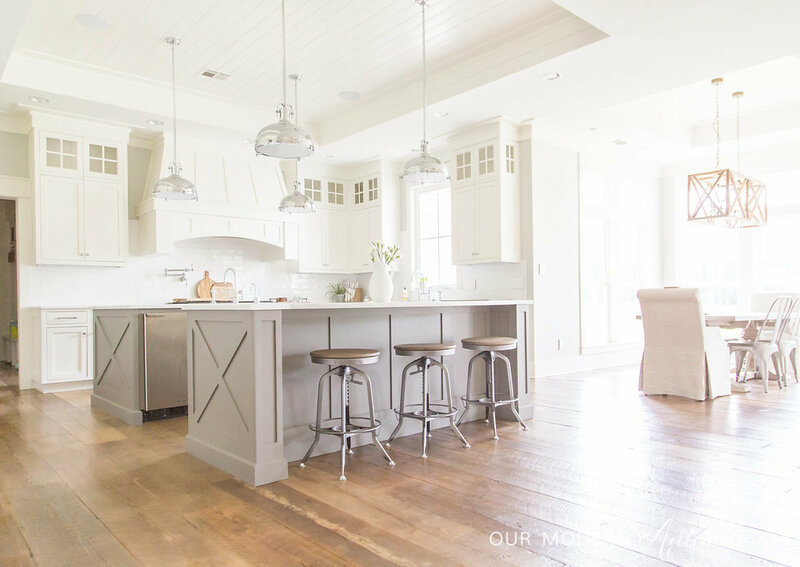 This kitchen and the double islands….I remember thinking when I first saw it, “Imagine all the cookies you could bake with all that counter space!” Hahaha! You know how I love to bake! Ashley chose White Dove by Benjamin Moore for the paint color on the kitchen cabinets. The islands are done in Chelsea Gray at 75%. You can find these gorgeous barstools at Restoration Hardware. 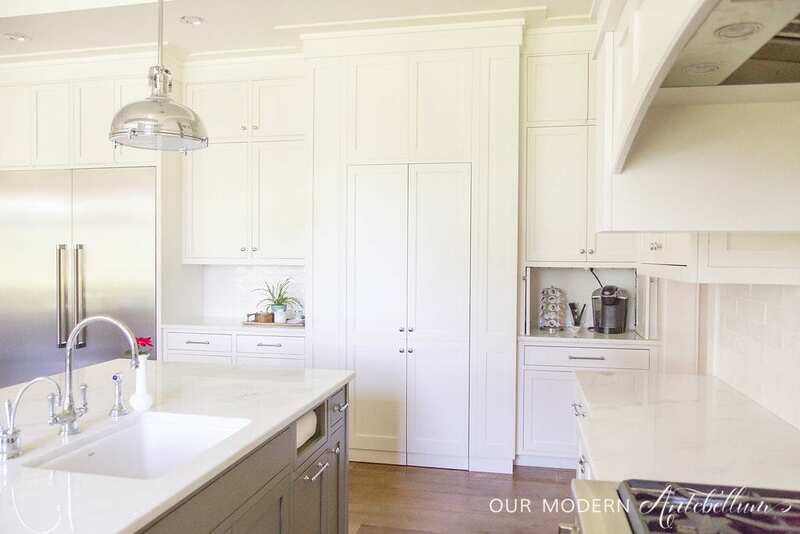 The countertop is polished marble, white based. 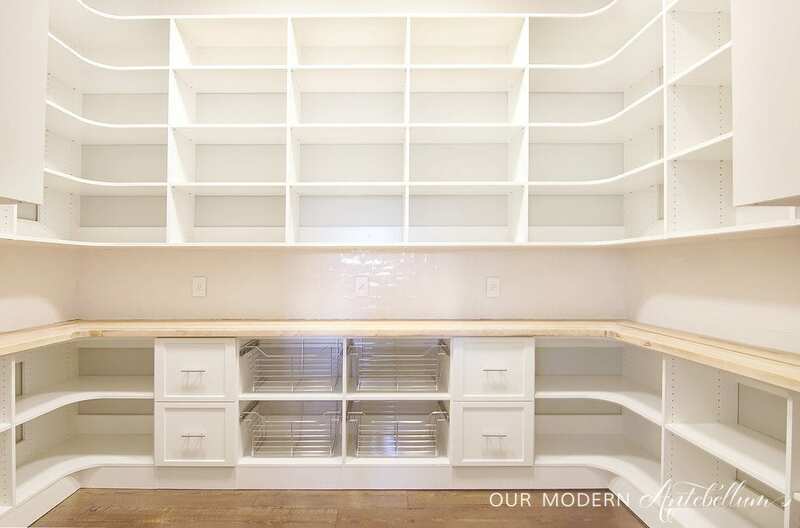 Do you want to see more of that pantry? Me too. Let’s go see! Look at all of that storage! For an organizational freak like myself, this would be way too much fun! I’ve said it in other posts, but I just love an open concept design! There’s nothing better than being able to entertain and visit with your guests. Also, I love being able to cook dinner and be around my kids or watching a television show with them and help them with their homework. This design of Ashley’s allows for just that! Notice the three sets of french doors! Can you imagine opening those on a lovely spring or fall day and allowing fresh air to enter in? It’s brilliant! You’ve probably heard me say that I love all housework except for laundry. But with a dreamy laundry room such as this one, I think I might never complain. Just maybe. 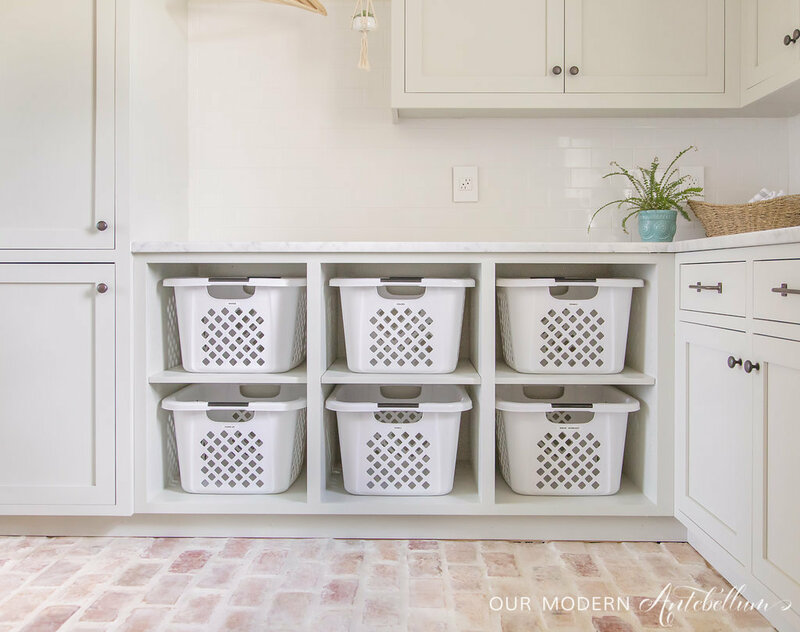 Most laundry rooms feel a bit like a dungeon, naturally, but not this one. The window allows light in and gives a beautiful glow to this space. This is my dream right here. I’m trying to figure out how to do this in my new little laundry room. It’s so nice to have a laundry basket for each member of the family. 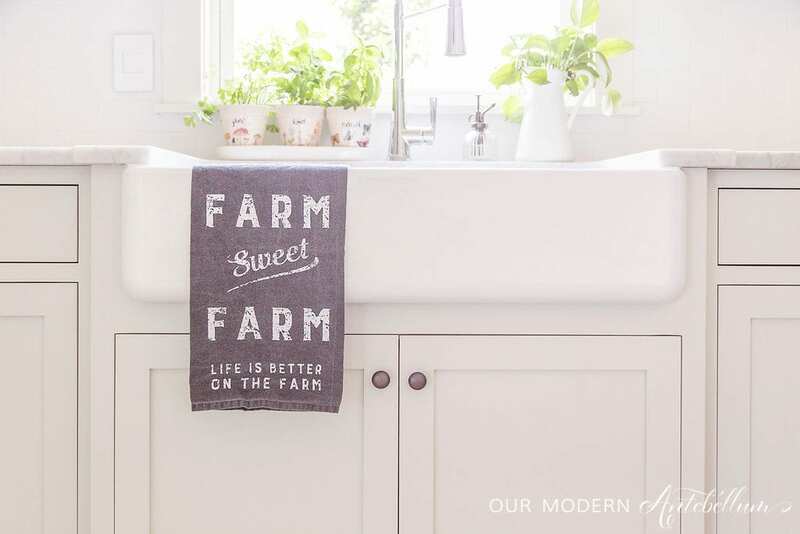 Don’t you just love her farmhouse apron-front sink? 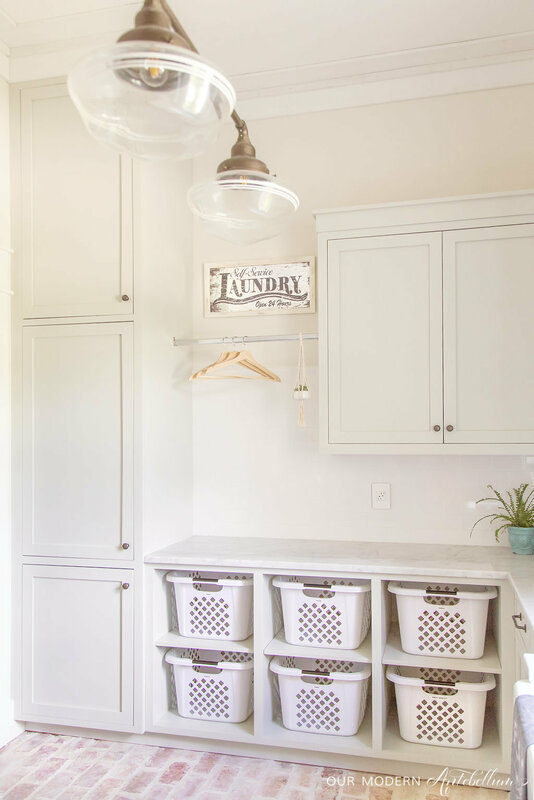 This might just be the most perfect laundry room I’ve seen in a long time! 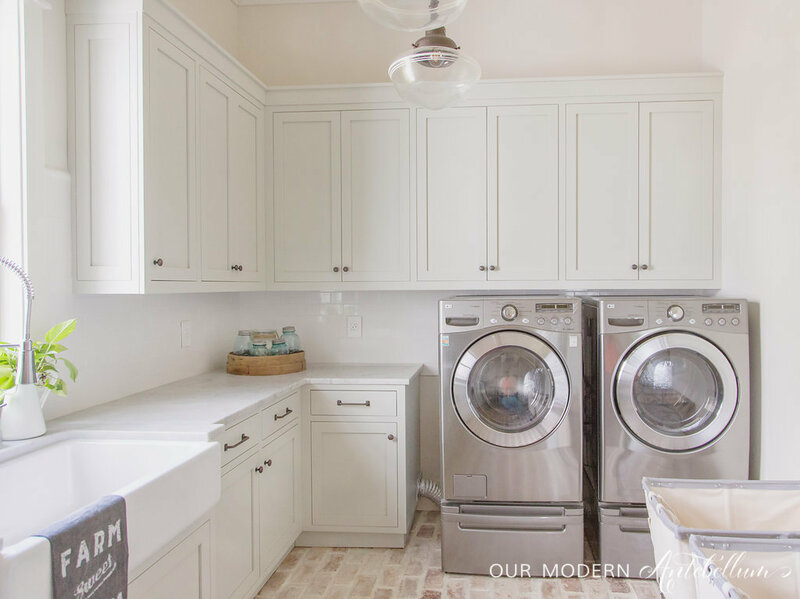 The cabinet color is Conservative Gray by Sherwin-Williams, the wall color is Classic Gray by Benjamin Moore, and the countertop is honed Carrara marble. 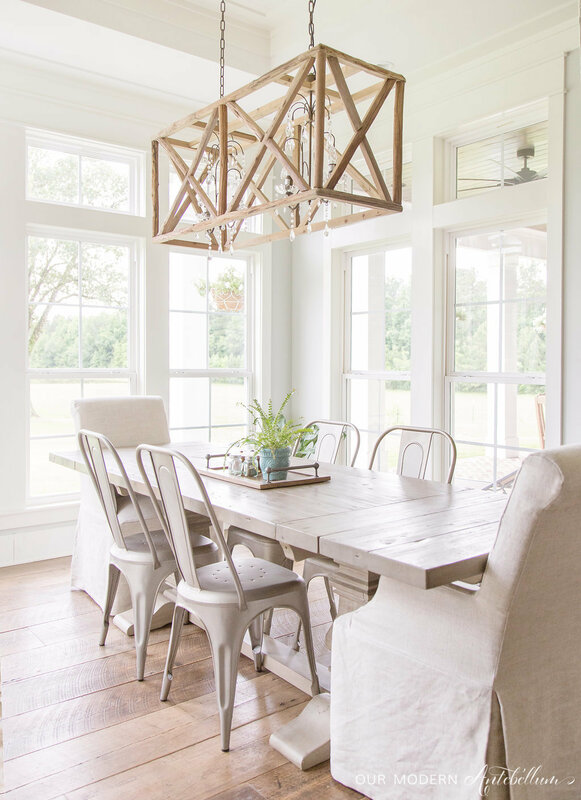 Just like the dining room, Ashley added a touch of elegance by using mercury glass candle holders to this beautiful rustic space. She’s consistent with the elements she uses to keep each space flowing well, from one to the next. So many homeowners struggle with this concept. Decorating Tip: Pick around 5 elements in your design and be consistent with them, if you’re wanting each space to flow well. 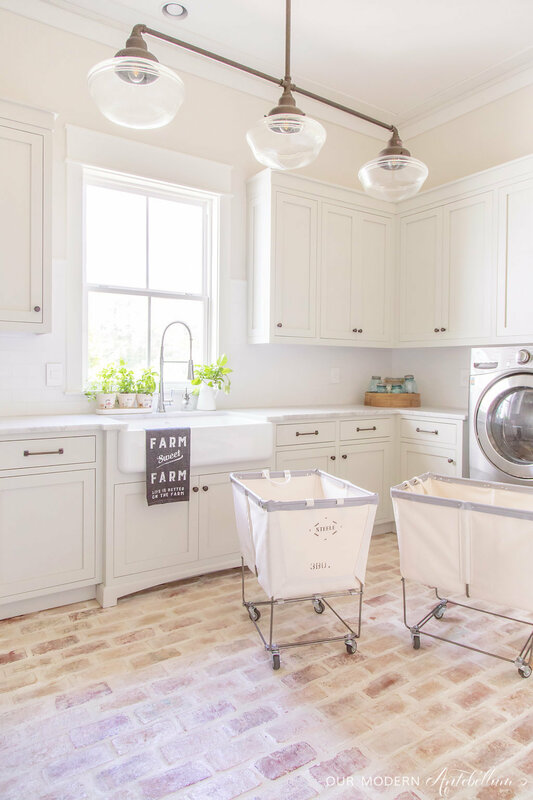 While this home is designed beautifully with farmhouse style, this bathroom is everything glam! Polished chrome, marble tile, beveled mirrors…..it’s all so dreamy! 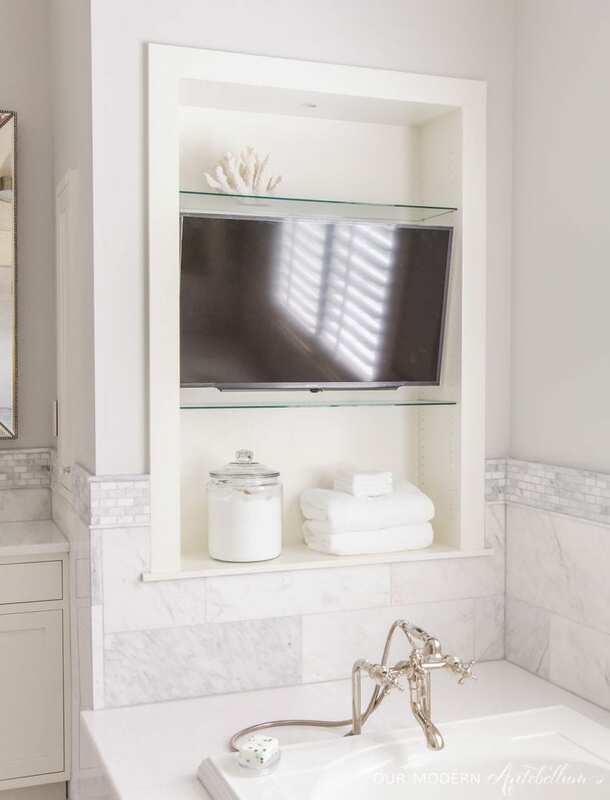 That TV is the perfect touch for a relaxing and luxurious bath. These glass and chrome pendants are lovely and simple while keeping the attention on this gorgeous chandelier. How much do you love the herringbone marble tile for the flooring? I’m in love. Wall color is Stonington Gray (Benjamin Moore) at 50%. The vanity color is White Dove. Countertop is polished thassos marble. 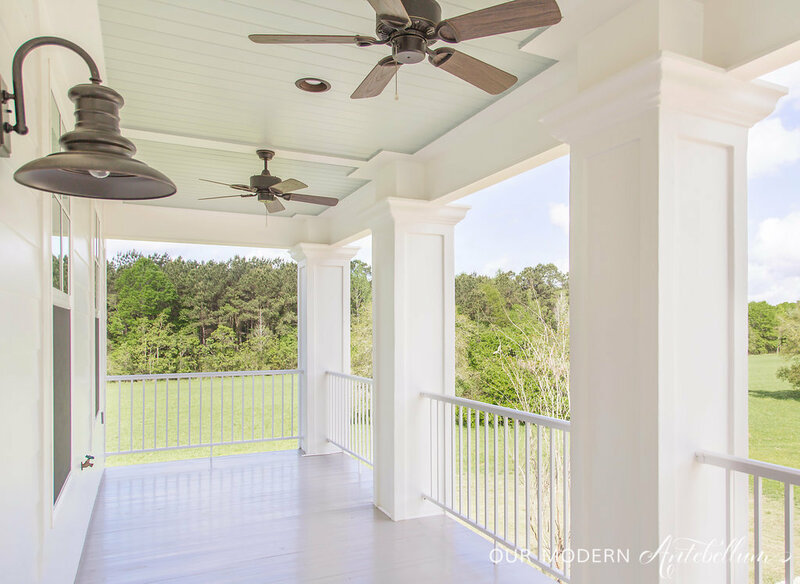 Even stepping out on to Ashley’s upstairs porch, there is a bright and clean look that transitions beautifully from inside her home to the outside. I adore a large farmhouse porch with ceiling fans and lovely lanterns. Hand me some freshly-squeezed lemonade and a few rocking chairs to watch the kids play and I’d never leave! And did you see her view? This property is just breath-taking! Wouldn’t you agree?! Thanks so much for joining me for another edition of Bright White Homes! 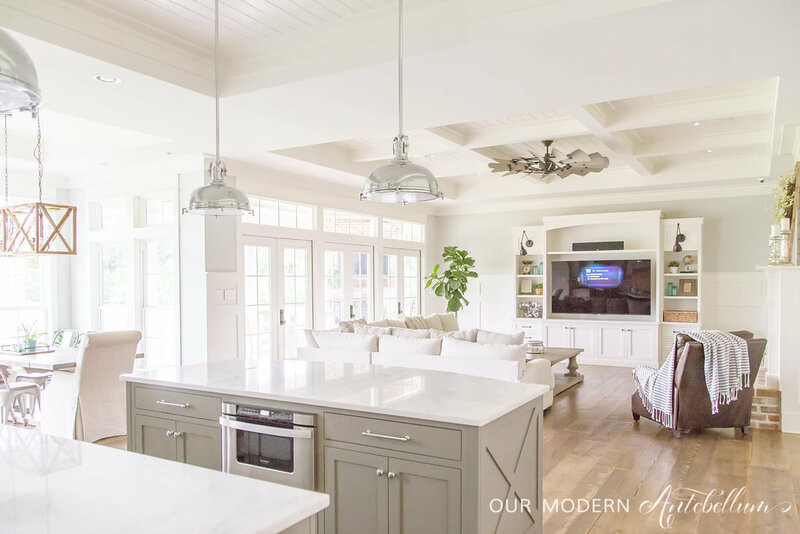 What was your favorite space in Ashley’s home? I feel like each space was designed and decorated with so much intention and flowed so beautifully from one space to the next. 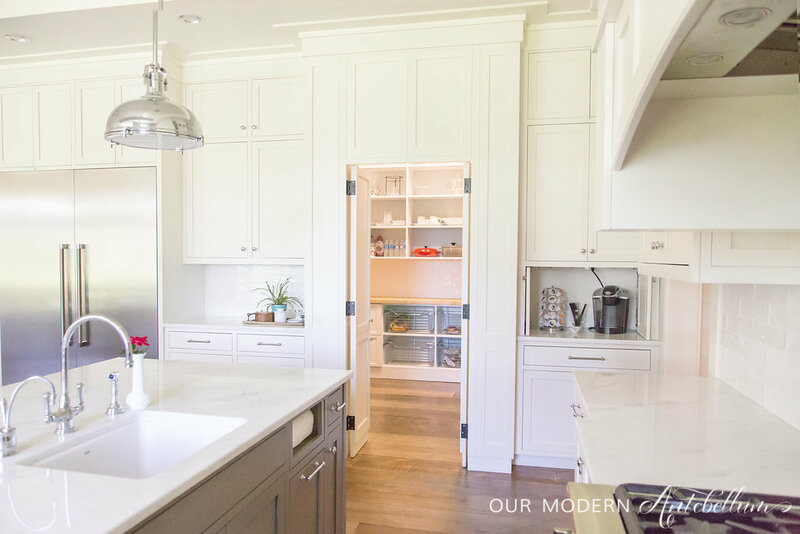 I hope this has inspired you to reflect on what changes you might want to make to create that same feeling in your home and I hope you enjoyed touring it as much as I did! Please follow Ashley on Instagram HERE for continued inspiration! Ashley, thank you for allowing us to tour your home! I would love to know the exact color and consistency % of her interior gray doors. This home is one of my favorites on IG!!! So excited for this tour! I just Painted my Master bedroom Stonington Gray yesterday!! And stumbled across this today!! Love the doors. Great idea as I was Thinking.. of course white. Thank you. 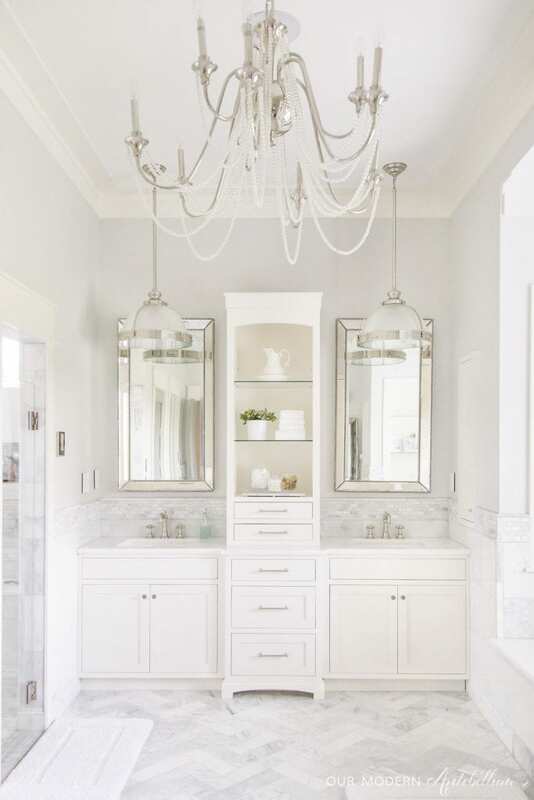 Do you know the brand of the chandelier in the bathroom? It’s breathtaking! What a beautiful home! Love that Dining area and the laundry room!!!! Very nice home. Hi Summer! What a beautiful bathroom!!!. 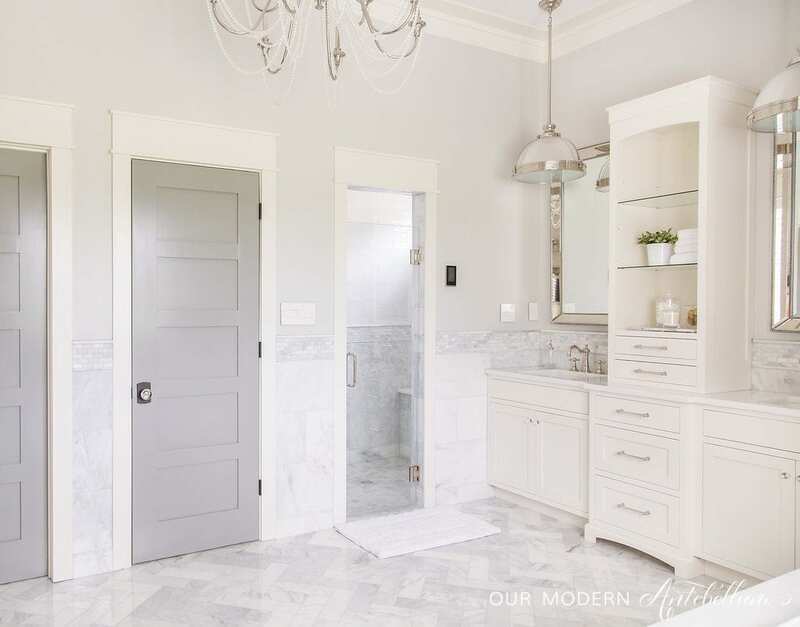 I am remodeling my bathroom exactly like this, but I am having a hard time finding marble like this. Do you know the exact make/color of the marble and counter top and back splash? Most marbles are carerra and they are very veiny and have so many different tomes. 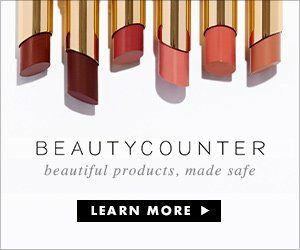 I would appreciate your help! Thanks in advance. Where is the toilet is the bathroom? I am remodeling aND have been looking for ideas….but no one shows the whole room…. Hi! Chelsea gray on the doors.. Benjamin moore or sherwin williams? Love this house!!! Found it 2 days ago.. Can’t stop looking at it. Do you know if Ashley will be posting Christmas decoration pictures?